It is certainly a day of quiet reflection for many, and yet the world continues to turn. People must go to their jobs, attend meetings, make phone calls, go to school, do homework, keep appointments… News is still reported as it happens and pop culture doesn’t freeze even though heavy weights of reverence are in abundance today. I call attention to this state of affairs because it is important to also recognize that even in the face of some horrible for one, for another, things may be completely different. People are born today, were born on this day, achievements are attained, milestones are reached, etc. There are two sides to all stories. Everything, as I have said times before on this blog, is about balance. Well, in light of personally wanting to be reverent but to also try and lighten some of the serious mood for those that need a short respite from possibly feeling emotionally drained thinking about the significance of this date in history, I’d like to highlight one of my favorite examples of emotional and business oriented balance that has come out of the art world in recent years. War Horse, the title of a children’s historical fiction novel by Michael Morpurgo, could at once seem like the biggest manipulation of literary material but also the most tactfully executed crossover of artistic mediums. The story at hand, having been written back in 1982, isn’t some novel that’s fresh off the writer’s block. However, when the book was brought to life on theater stage in 2007 under the same name for broadway production, suddenly the story took on all new levels of appreciation and acknowledgement. Capitalizing on what was obviously a hit in motion, Stephen Spielberg forged forward with a film adaptation of the story that came four years later. With the three of these things circulating through the public at the same time, the tale of War Horse was certainly regarded as a profitable success. However, it would be somewhat ignorant to say that fascination, interest and engagement in discussion on the topic of War Horse’s setting, the era of World War I, was absent from any of this immense pop culture popularity. Sure, there are actors or actresses one might like from the film or awe-inspiring realism given to the play but the fact of the matter is that the subject and core element of the plot, namely Joey the horse, was brought into the ranks of the first global war to arise in history and no amount of special effects or cool costumes can affect that crux of the plot. World War I and the uncertainty it brought, had to remain intact for the story to be able to play out with any sense of integrity to Morpurgo’s novel. Thusly, as young audiences would take to the tale, whether by movie, book or play, undeniably they would be delving into that could be both sentimental and fantastic without losing the sensitivity and grounded reality toward that period in history. In other words, World War I wasn’t used as an afterthought element on top of “a story about a boy and a horse.” The seriousness of the history is just an integral as the fictional relationship between the two characters. As such, despite the somewhat exploitative looking nature of stretching the material out over two adaptations, the substance remains and the historical substance is what keeps people aware, interested and possibly changing how they choose to be informed about current events in the present day. how in the distant future, people from the arts world might work together to keep the significance of our memories from the past 11 years alive. War Horse does show that there is a way to “entertain” without making the necessary negativity and past pain the focal point of our entertainment. There is a show of real grace in the puppeteering done for War Horse and a sense of on-stage magic meant to evoke empathy and lifelike emotion. In this way the cast can thrill an audience without overshadowing. 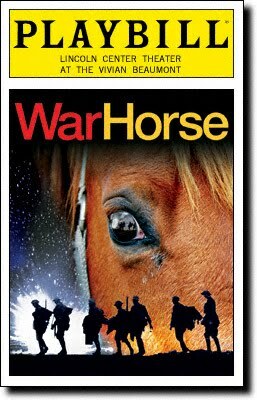 Instead, something so detailed and intricate as a three-man-operated life size horse puppet furthers the audience’s atmospheric investment and enhances the bigger picture of how the relationship between one man and one horse fit into the chaos that comes with war, separation, love and loss. Effects aren’t just there to be effects but supports for a more connected takeaway. How the stagehands and puppeteers even describe the Joey puppet in operation goes to show just how intensely this team thinks about realism rather than radicalism purely for shock value. A rare accomplishment in the face of technology flooding the world many times for the latter purpose. This video, produced by Wired.com, describes Joey’s construction, operation and the crucial factors to a successful execution of his character on stage. It’s impressive and as I mentioned above, just magical enough to show tasteful artistic merit. P.S. War Horse’s broadway run is ending on January 6th 2013.